While it should have been impossible for something like the Holocaust to take place, it did. Now that we have this history we must deal with it as best we can. Events such as this simply overpower the present. For this reason, perhaps, there exist physical places to anchor those memories, so they can be put somewhere. So how do you spatialize memory in a meaningful way that also animates and informs the surrounding metropolis? As an architect, how do you materialize the horror, the madness, and the dehumanization? You can't simply re-create a concentration camp. As Christopher Hawthorne, architecture critic for the Los Angeles Times so aptly put it, "The architect's nearly impossible job is to mark murder on a mass scale." 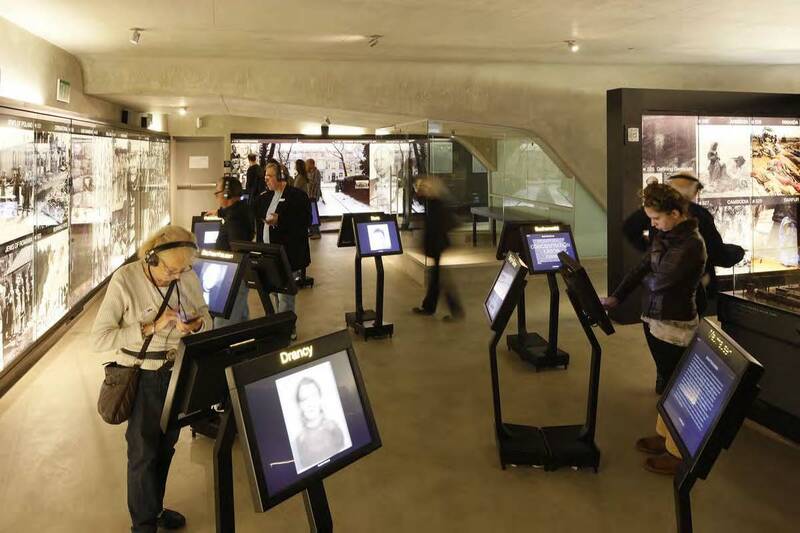 So what does a museum devoted to the memory of murder look like? 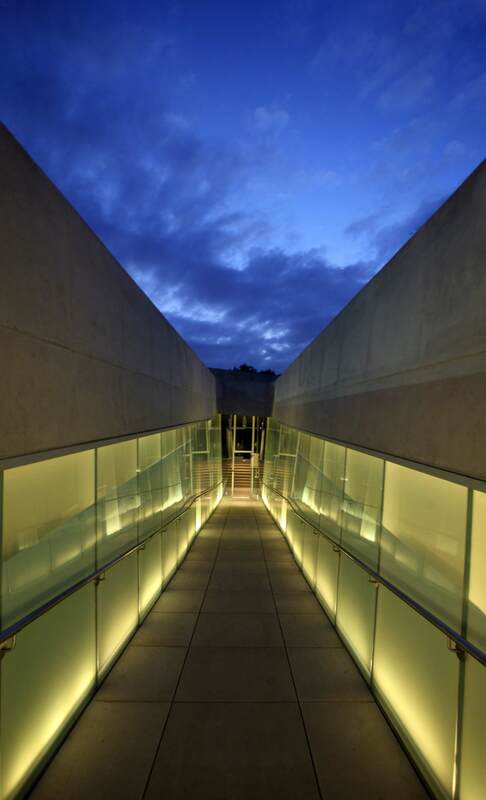 Descending down into Hagy Belzberg's new Los Angeles Museum of the Holocaust may provide some clues. 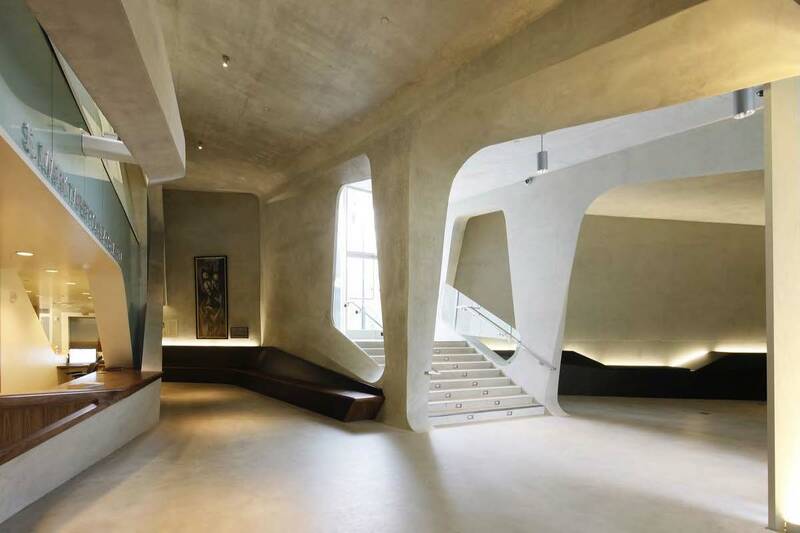 Rather than embodying violence and confinement as Daniel Libeskind's Jewish Museum in Berlin, Mr. Belzberg chose to emphasize the hope of release. 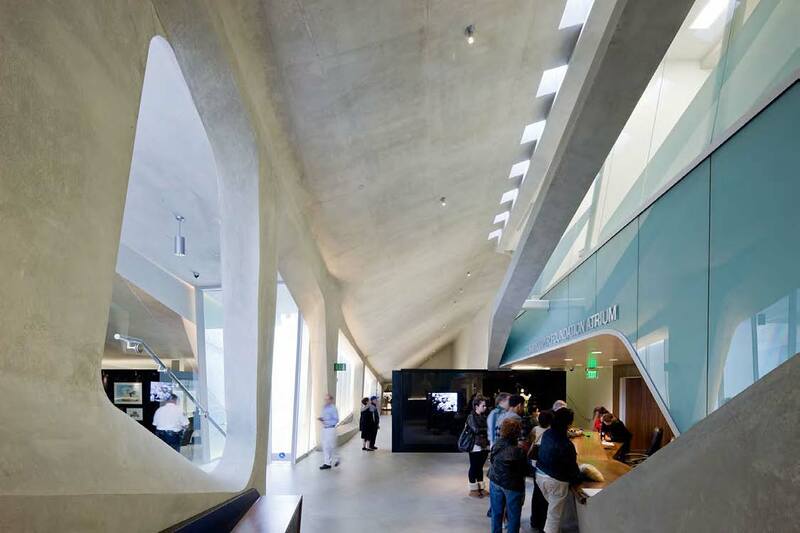 While Libeskind took inspiration in part from intellectual sources like Arnold Schoenberg's unfinished opera, Moses und Aron, and Walter Benjamin's One Way Street. Mr. Belzberg drew from the everyday experiences of Pan Pacific Park, where the museum is sited off to one edge. 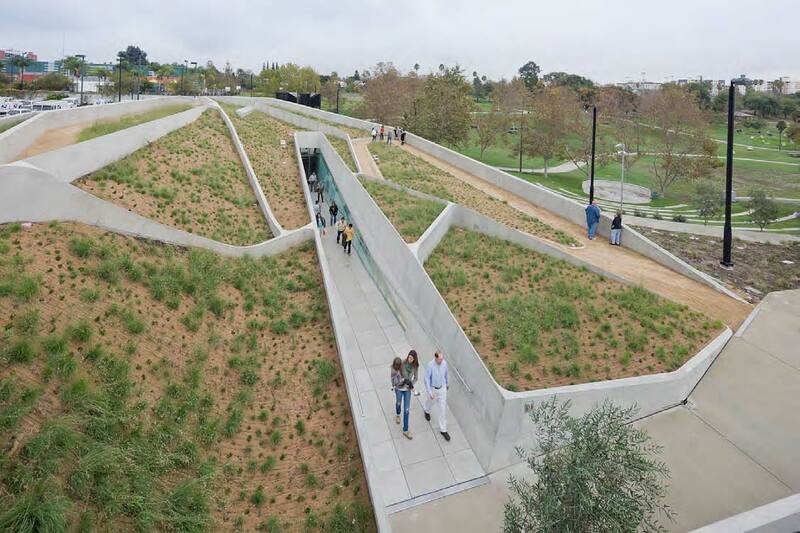 The normalcy of the park is where the journey through this "green", LEED Gold museum begins and ends. As Mr. Belzberg's brief for the project describes, the dichotomous relationship between the building's content and the peaceful landscape mimics the proximity "German forest revelers enjoying public parks were to sites of horrific and inhumane acts being carried out in the 1930's and 40's." This is one reason Pan Pacific Park is such a surprising yet appropriate location for the museum. The form of the building was designed to interplay with the park setting and modulate the experience of the outside from within. Wedged into the earth like a berm, it seems to have been carved out rather than built in. Moreover, its placement allows the life of the park to carry on. In keeping with this, the building's green roof, designed by Karla Dakin and Lisa Benjamin, seems to flow from the park's grounds. It's responsible, low-water mix of plants includes Blue Grama and Esparto Grass, Pine Muhly, Red Carpet Stonecrop, and Star of Bethlehem, a type of Hyacinth. When these reach their projected height of thirty-six inches, the building will become even more integrated with the landscape. The curved shapes of the building's structure immediately bring to mind Zaha Hadid's aesthetic. But here such futuristic-looking contours make sense because they embody the continuation of the park's layered geology. These computer-generated forms were physically achieved by employing shotcrete, a form of concrete that is pneumatically projected into shaped reinforcement--a method commonly used to make swimming pools. 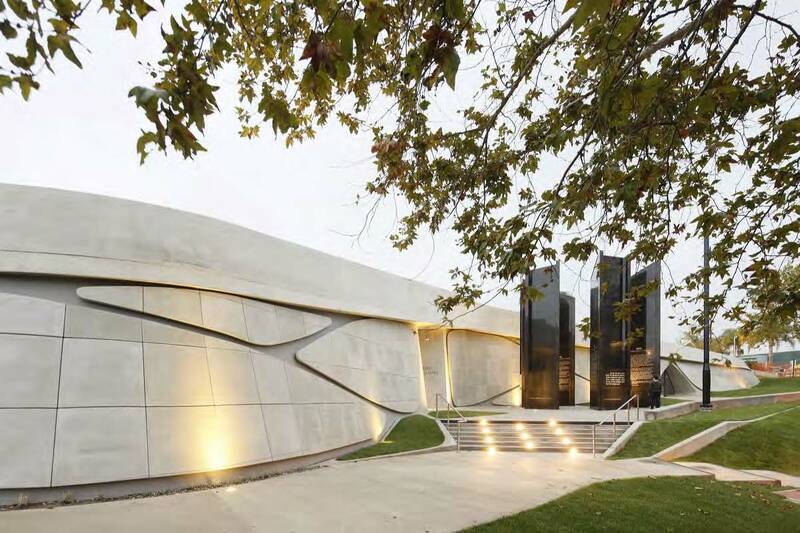 The museum's design also derives from Mr. Belzberg's desire to transition patrons from the light, airy normalcy of the park down into a sequential experience that becomes ever darker and which follows the progression of genocide. As Mr. Belzberg explained to me, wherever you are in the interior there is a glimmer of hope for exodus. You never lose sight of the sun even as you progress into darker and darker areas. Patrons depart their daily world as they descend down the long ramp to the mostly underground structure. Like the Holocaust itself, the building thus represents the interruption of everyday experience. As one walks down into this porous "cave", the green roof gradually recedes and gives way to the entry lobby. Unlike the experience of Holocaust victims, though, we in the present immediately know how this journey is going to end. The exit is just in front of you, looking out at the original Holocaust Memorial that the building frames and accents. The subtle passage through light becomes somewhat abstracted by all the displays and technology on the interior. There are fluidly interactive touch-screen monitors throughout. The first one encountered is a giant table, designed for community engagement. Further inside, individual touch-screens make the experience more personal. People become divided as prisoners were in the camps. While the displays are necessary to communicate content, their obvious presence at times obscures the building's gentle orchestration of light, space, and its connection to the outside. One wonders if the architecture would not be more powerful without all of this. Here, then, is the difficulty of reconciling such content with architecture. Sometimes less is more, but with the Holocaust there is just so much to show that such austere minimalism would be inappropriate. After all, the point of the building is to bring the horror that took place out into the everyday world. When I asked one Holocaust survivor what he thought of the architecture, he just smiled and said he was glad this place was here.